Structure. Technique. Ability. Reaction. Strength. Soccer gives us the ability to help kids develop basic life skills in a fun, no-pressure environment. The STARS program not only teaches those skills, but takes the next step in showing youth that those skills are transferrable to many facets of every-day life. Through drills, games, and conversation, STARS takes the skills developed by agility, technique, strength, and integration training, and helps kids turn them into life assets, focused on leadership, teambuilding, discipline and respect. In this one day or multi-session program, players will learn to hone their basic skills to develop their play to the best of their ability. They will begin to identify their own strengths and weaknesses, as well as those of their teammates, in order to discover how to best work together to achieve their goals. 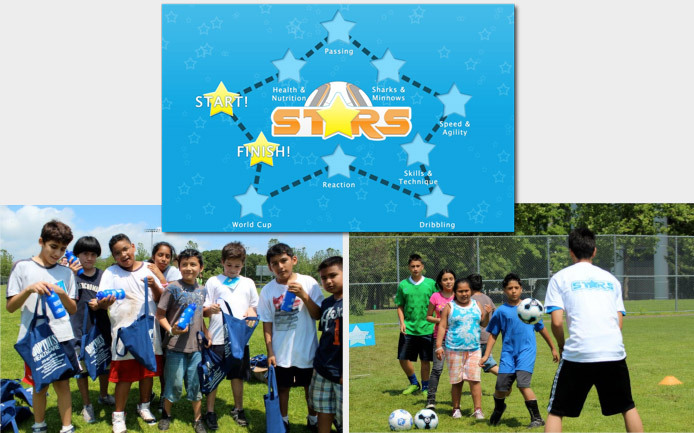 At the completion of any STARS session, kids will be challenged to identify the things they learned and why they are important in both soccer and their daily lives.